From "high end" to "bargain basement"
EXCELLENT IMAGE FOR LITTLE MONEY! 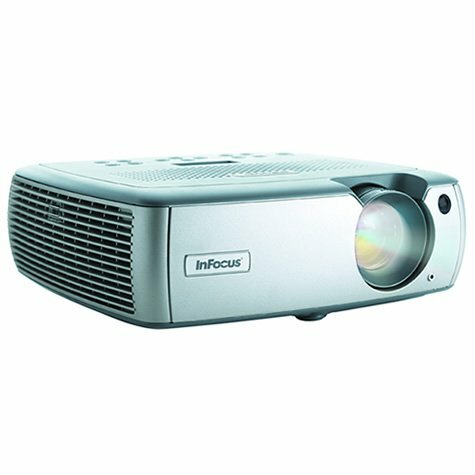 I bought the Infocus X2 to replace a worn out and broken $15,000.00 "high end" CRT projector. My budget would not allow for a more appropriate replacement. 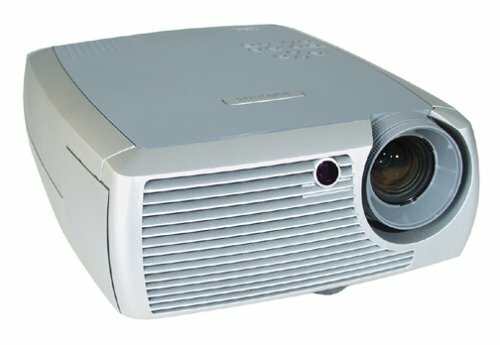 While the X2 could never satisfy the true videophile, who usually spend anywhere from $10,000 to $30,000 dollars on a projector, it was never intended to. That being said, I will say that the Infocus X2 when being shown on my Stewart 100" screen is projecting an impressive image that is pretty close to the $15,000 unit it replaced!A true videophile will certainly see the difference, but your average person will not. With my limited budget, I am quite satisfied with the very good image quality.DVDs are sharp and clear, TV is quite satisfactory also. If you are looking to enter the big screen front projector market, and you don't want to spend more than a thousand dollars, here you go! But seriously folks, even though it works, stop shining your projector on a wall....get yourselves a screen. There are special reflective properties in a screen that a painted wall doesn't have to really bring your image to life. Hi Def TV, Cable, DVD's and X-box all look Fantastic! Bottom line - best major purchase I have made since I bought a home with a finished basement! 4:3 overide (controls regular programming)= 480p. I am also using the expensive $99 monster DVI cable to connect to the cable box. This is essential to make regular TV look great vs grainy.Get the DVI to M1 connections, wires and adaptors - you MUST budget this into your overall budget or the projecter will not be a great buy (see my "problem" section below). 2) X-Box. I purchased the Hi-Def cable/wire from Microsoft for $20. Once you buy the cables, you can go into the Xbox dashboard settings to allow for 720p and 1080i. Most games are in 480p and 16:9 format. The few Games in highdef look fantastic!You can check hdtvarcade.com to see the exact resolution of every game. 3) DVD player: Since the Xbox only outputs in 480i, I wanted to try the upconversion DVD players. I first tried the Denon 1910. That did NOT work when using a DVI cable!!! It might have been because it was refurbished or possibly it was because the Infocus X2 is not HDCP compliant?? I'm not sure, but the 1910 warns against non-HDCP compliant units and InFocus says that x2 is non-compliant - so that's my best guess. Next I tried the TOSHIBA SD-5970. That worked, and I hooked it up using the $99 Monster HDMI to DVI cable. I'm not sure if it was worth it, because DVD's look great, but NOT Amazing compared to HiDef Comcast programming. The verdict is still out, but I have never seen any of the DVD's like Finding Nemo that supposedly look MUCH better with progressive scan DVD's. I can't tell much difference between when DVD is set to 720p vs 1080i HDMI output. 1) My InFocus X2 does not have any component inputs. That means to get premium quality, you must come through the M1/DVI input. If you have a DVD, Cable box and Xbox like me, it is a real pain to switch the cable in the back (especially with a ceiling mount). I got myself a step ladder to make it easier. The DVI switcher for 4 DVI cables is TOO expensive, almost $400. 2) Be prepared to spend at least $3-400 after you get your InFocus to purchase DVI cables for the cable box, possibly HDMI cables if you buy a progressive scan DVD player, as well as adapters to connect your DVI cable to the M1 computer port... Its definitely worth it, but just be prepared.In my opinion, the progressive DVD player is optional (saves you approx $150), but the cables are mandatory. 3) No way to turn off unit with remote (and yes it is still a little noisy in whisper mode, but once the movie starts you can't hear it anymore). I have it set-up so that after it cools/powers down I just turn off the entire unit on the wall switch since it is ceiling mounted. The de-interlacer chip is unneaded as long as you use all progressive sources. In fact when you input HDTV it uses the same scaler as the X1 and H30 projectors. The image quality is great.Just dont try and watch TV on it, you'll claw your eyes out. I can't push that enough, the projector is awesome, as long as you use NO interlaced sources. I did a lot of homework before buying this product (my first projector). If you've done the same, you'll know this is a great projector for home theatre use - with all the right features and a lot of bang for the buck. This is all true. 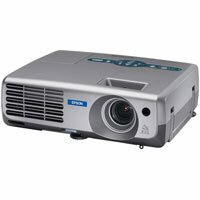 I sampled projectors with better/higher features and saw nothing worth twice the price. There is no doubt (unless money truly is NO OBJECT) that this is the projector to choose for home theatre. It seems that the picture is made of RGB images that alternate faster than the eye can notice (in other words, that there is a red image followed by a green image and then lastly a blue image - each a few dozen times per second). If you wave your hand infront of the projector very fast you can see the image break down on different fingers as different colors. A similar effect manifests when your eye moves accross the screen very fast, or if a high-contrast, highly-bright image moves across the screen very fast. You will notice three objects instead of one (red, green and blue). For example, in a largely dark scene, a light bulb will seem to have three colors if you move your eyes fast around the screen. I suspect the scene with dueling light-savers in Star Wars to be the perfect example of a bad scene for the rainbow effect - it's mostly dark and has small bright features that move fast. For me this is almost a deal breaker and I regret dropping a grand for a few features I probably wouldn't miss with an ''inferior'' projector. The problem is: I don't know what projectors there are out there that won't have this problem and have anywhere close to the performance of this one (adjusted for price). 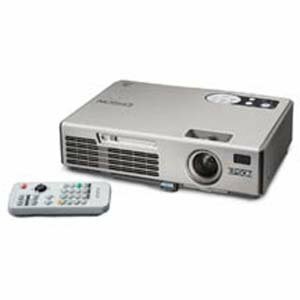 Projectors have shrunk both in size and price; This unit is the perfect example. The Ultra-portable InFocus LP70+ is less than $1900. It boasts 1,400 lumens, 4,000 hour lamp, VGA (1024 x 768) resolution, 2.4 lbs, 2.58 x 6.1 x 7.8 (90% of the size of a cigar box), keystone correction of 15 degrees, 22.2' max image size, 1 watt built-in speaker, 120-240 volts, 1100:1 contrast and a 2 year warranty. When ordered through Amazon.com/JR Music World, there is a $50 discount and no sales tax (outside of NY) for a savings of nearly $200. Total price before shipping: $1,873.33. InFocus and other manufacturers have other even smaller models but they are not as bright. The LP 70+ provide the most bang for the buck. You can find less-expensive projectors ($799, $899) but they will be SVGA (800 x 600) resolution (fuzzy). Many hotels charge $500/day for LCD projectors. Meeting planners will love to hear you can supply your own projection equipment. I have used a Proxima x350 for the past three years. It is a great projector but the LP 70+ is much brighter and much smaller. I use my projector four to five times a week; I fly 4,000 miles/week. Weight and volume are major issues. The LP 70+ is more than a pound lighter and significantly smaller. Whether you are designing parachutes or carrying luggage, weight and volume are of great concern. Search for the smallest and lightest equipment. I love the LP 70+; you will too. A new level of film-like realism and impact. The PT-AE700U is the most impressive home cinema projector ever from Panasonic. Compact enough to sit on a bookshelf, it is packed with advanced features designed to bring you a whole new level of home theater enjoyment. Dynamic contrast is now 2000:1, by far the best in its class, so the picture is sharp and clear even in a well-lit room. New integrated cinema quality circuitry includes a Dynamic Iris optical system that constantly adjusts the brightness and gamma characteristics in real time, so the picture is always optimal and transitions betweens scenes are more natural. An innovative color correction system - developed after consultation with top Hollywood colorist David Bernstein - incorporates Cinema Color Management technology to ensure faithful color reproduction. This cinema-quality integrated circuitry brings you on-screen colors just as you would see them in a movie theater. And the PT-AE700U comes with advanced Smooth Screen technology that effectively eliminates the typical "screen door" effect, so the images you see on the screen are natural and lifelike. This was my first projector. I researched a lot of different models and finally decided on this one because on paper it looked to give the most bang for the buck (my price range was $2000-$3000).I also wanted native 16:9. After owning it for over a month, I'm quite happy with it.It has none of the flaws usually associated with LCD projectors.There is no "screen door" effect at all, and the black levels are very impressive. I have the unit mounted to the ceiling (purchased RPA mount for $190) and project onto a 120" gray screen. One feature that helped clenched the deal for me is the 2x zoom lens - I have the projector situated less than 14 feet from a 10-foot diagonal screen. I had a little trouble with the mount I purchased, but the projector itself is incredibly easy to setup and operate.The joystick next to the lens lets you to control the horizontal and vertical shift without tilting or moving the whole unit.Remote is back-lit.Menus allow plenty of tweaking.You can store user-defined settings or use factory presets (like cinema, natural, dynamic, etc.). I have the projector in a dedicated home theater room with no windows and keep the lights turned off while it's running.If I had to deal with ambient light though, I probably would have chosen a brighter projector since this one is only 1000 lumens. I mostly watch DVDs on this, but also use it to watch cable and play video games - playing Halo 2 on this is an awesome experience! Don't be fooled by the low price of this projector. Until DLP HD+ Projectors drop to this price range there is nothing that can come close to beating this projectors value for money. The new breed of LCD projectors have come a long way in displaying BLACK close to true black with high contrast ratios. I shopped around a lot for projectors and seen projectors from Runoco, Sony, Sim, Marantz, etc which vary in price from 3k to well over 15K. I wouldn't say this Panasonic is the best but for the price I am paying, I am really not losing much of quality gain. I project the picture on 100" screen from Carada (another value/quality company) and it did nothing less than 'WOW' many of my friends who watched movies on it. Best investment made in a long time! I've bought this projector with a free screen at Costco for only (...)and received a (...). The setup was a piece of cake. The projectors noise is very low, the picture quality is outstanding. The projector is hooked up to our Xbox and a stereo system. Watching movies on the Xbox works fantastic, so does playing games. No need to go to the movie theaters anymore. Playing games on the big screen makes you feel as if you are in the middle of the action. Especially recommended - Splinter Cell Chaos Theory!!! The vid quality is great.Yea vid res isn't really high, but for the money you need to spend alot to get high res and get good color and frame rates.There are some projectors that offer higher res for under $2000, but they are typically not suited for movie use.If you going to do buisness presentaitons maybe go with another.Ifthe primary use is for home theater this is the way to go!!! !Although I did get this for buisness use and do presentaitons, it is somewhat weak in that use. Oh yea... while your at it get the Led Zep DVD - looks great on this projector. The picture quality rivals systems that I've seen costing thousands more.I carry the 4805 in a briefcase from my southern cal home to the home in northern cal. I project onto the screen it came with, however in my norcal home I project right onto a wall the is approx.12' wide. The wall is painted off white and has texture, however you can't see it.The picture is still crystal clear. I am so hooked on the quality and ease of operation of this projector that I am buying a second one, so I can do a perminent installation. Just purchased the SP4805 and Love It! 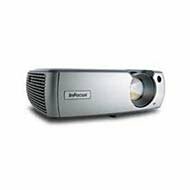 After a labor intensive literature search of tech-related website reviews of projectors, we settled on the SP 4805. After reading all the product reviews and comparisons, we narrowed our search down to only InFocus products -- the X1, SP 4800, and 4805. The X1a and X2 do not have the Faroudji processing, therefore eliminating them from our search (the X1a and X2 currently have manufacturers rebates, and without the special processing algorithms, I can see why they're on sale). The SP 4805 is a newer version of the X1 and SP4800; the SPs are "optimized" for home theater use versus business use. We paired the projector with a Yamaha receiver and Klipsch speaker system. We get an approx. 100" dia. image on our wall (you can set the projector to letterbox, 16:9, or 4:3) from about 15-20 ft away. I liked how easy the setup was and the companion instructions on use are straightforward. We hooked up our DVD player via component cables and the resolution is fantastic! (Of course, we had to test it with Lord of the Rings). If you're doing research on purchasing an overall home theater system without paying alot we were able to do it in under $2300 (projector, screen, speakers, receiver, and all cabling -- the cables are an additional cost that adds up). I read alot about ghosting and other issues involving these type of projectors. I am not an expert in the subtle differences, though we do own an HDTV so I have become accustomed to the hi-res images. Given this caveat, I can say that the resolution and overall image quality is amazing. It is a true movie theater experience! We've had this projector for about a month now, having bought it unseen and untried based on high user ratings from another web site. Our viewing location is flooded with ambient light but this machine still throws a very discernable image even on the low-power setting. With a distance of about 13 feet we get a 90-inch (diagonal) image (7 feet x 4 feet). We project on a panel of sheet rock painted white and have the projector sitting upside down on a board hinged to a wall just below the ceiling, supported by two pieces of chain to the front of the board. We're happy with the results using the supplied S-video cable. If the remote is used to control the lamp, the fan always remains on, which is a bit annoying and my reason for only 4 stars. The low-power fan noise itself isn't bothersome during viewing. We have tried the high-power setting only briefly since we don't need it and it results in a noisier fan and decreases the life of the bulb. The machine does produce some rainbow effect for people susceptible to it. We don't have experience judging the blackness of blacks or the whiteness of whites, nor some of the other technical aspects that videophiles might want to know about. We had an easy time hooking up an iBook to it though. The H31's DarkChip2&trade; DLP&trade; technology by Texas Instruments and 16:9 aspect ratio deliver an authentic movie theater experience within the comfort of your home. The H31 is fully compatible with 480I, 480p, 720p and 1080I in both YPbPr and DVI-HDCP inputs. 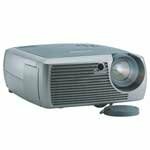 Its 850 lumens and 3,000:1 contrast ratio give you ideal home theater brightness and superior color reproduction. 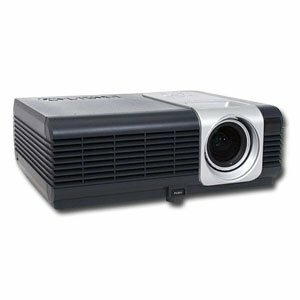 HD scaling enhancements, quick zoom, adjustable memory settings and digital lens shift give the H31 unmatched flexibility and precision for any projector in its class. -Yes, since this is an LCD projector it has several limitations, including the screen door affect and is also has limited resolution at 800X600. Although many people kick up a fuss about both of these traits, neither really matters. If you sit close enough to see the screen door affect or the individual pixels for that matter, then you probably won't be able to see the whole screen because you are sitting less than one foot away from it. I bought my S1+ about 2 months ago and use it everyday. It has taken a beating when I take it friend's houses, parties, ECT. But has shown no signs of the abuse. When it is set up anywhere from 30" to 60" it looks the same as plasma or a large projector, except it is better because it does not have the glare of a normal TV. Since it's purchase I have also set up a 14-foot screen made of poster board in my garage (it will project nicely almost anywhere on almost any surface), which looks awesome and beats almost any other theater that I've ever been in. When I first started looking through projectors I wanted something that should accept any interface that I threw at it. When I came across the S1+ I was intimidated because I didn't know how well it would project video games such as Halo2 for XBOX. After it's purchase I was relieved to find that I could have my computer, XBOX and PS2 all hooked up to the projector at the same time and switch between them using the remote control that came with it. All of them are awesome, especially with surround sound and games like DOOM3. Even when split into 4 screens for Halo, it's still quality. Also this is a pretty bright projector, I can have my windows open with several lights on and still easily the screen as if it was a TV. This costs less then a plasma or a projection TV and can be made much smaller or larger then either. When they say 30"-300" they mean it. It will consume any wall you put in front of it. Last, it is the easiest thing to transport I have ever seen. For a LAN party I throw my projector, surround sound system and my XBOX into my backpack, jump on my motorcycle and am off in just a few minutes. If you are new to projectors or are just looking for a large HD TV at a good price, then this is the one that I recommend. I am not sure how long the bulb last (some people say they die quickly), mine is just passing 500 hours, but they only cost $175, which is significantly less then most other projectors (around $350). 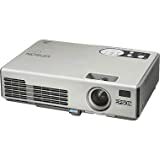 After borrowing a friends Sony VPLCX6 projector with 2000 lumens and watching American Idol and "I Robot" on my great room wall I was hooked. An exhaustive 2 month online ,in-store and Pawn Shop search ensued. I had 3 criteria to meet, under $1000, atleast 1200 lumens and minimum 800x600 native resolution.After searching every electronic outlet in the greater Peoria area my Father in law pointed me to Sams Club. 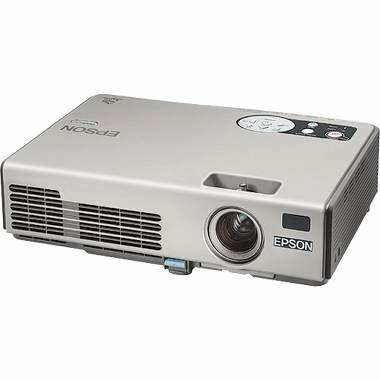 The only projector they carried was the Epson Powerlite S1+ and @ $699 with 1400 lumens this was the culmination of my search. I am projecting an image 8' x 6' onto a 1.3 gain theatre screen. With the s-video connection the picture is fantastic. Most broadcast cable is quite clear, satellite channels are better and DVD is awesome. Screendoor effect is present as the image is quite large but easy to ignore and lose it as the images are very crisp. Only if I were rich beyond rich would I go with a higher end projector! Just purchased this (check online for rebates) for a budget home theater setup.We are using this projector on an 80" screen in a very dark basement.While you can certainly get better contrast and brightness from other projectors, I challenge anyone to find a better value for this price point.I was not really expecting much from the projector when we purchased it and thought that this may be a good device for the kids to watch movies / play games on. 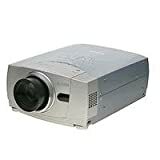 But are finding that we are watching many more movies on this great projector.Low upfront costs and low bulb replacement costs make this a good choice if you are just getting into a front projection system. I suffer from DLP rainbow effect so had to go with an LCD unit.Colors are not as vivid and with the lower contrast ratio video images are not as good as DLP models. "Screendoor effect" is extremely noticable especially in white/bright areas of video. don't be fooled by the advertisment that this accepts component video signal (which gives you the best possible image). I purchased a vesa adapter to connect via component video to the monitor connection on the unit.it didn't work.after some research, I found that you can only use Epson's adapter to make it work which runs $100.Now, am I going to get $100 worth of image gain over s-video? i don't think so. do not buy this if you want to connect via component video. i read that Epson is the only company that doesn't use the standard adapter. I also received a brand new unit with a dead pixel, which i read is pretty common for LCD projectors over time but i didn't expect it fresh out of the box that way. When this projector works, it works well.It has a nice, bright image and good clarity/detail.It is quiet, runs cool, is light, and fairly portable.Compared to others on the market, the value per dollar is excellent.I seem to have had machines with teething problems though. My first projector, purchased new mid-January of 2005, exhibited all the symptoms of a bad bulb within 2 weeks, and 20 hours on the clock.I called Epson tech. service, was walked through some diagnostics, and was told that a new projector would be out quickly.I received my "new" projector (actually a refurb. unit with more hours on the bulb than mine had) the next morning.Great turnaround, but to get a refurbished unit for my two-week new one, especially with the bulb hours as they were was no bargain.I called customer service to voice my opinion on this and they agreed that I was due compensation - I was promised a new bulb but never received it.I am still fighting for one. The second projector worked for another 2 weeks, then operation became intermittant for a few hours, then the unit stopped working completely. After another over the phone diagnosis, the rep. told me the bulb was bad, but that bulbs were out of stock -- same story I had received earlier.As of this writing, I am still waiting. Word of Warning. I purchased a BenQ projector and had it for a month before it started to fail and turn itself off.I sent it to BenQ for repair and have not recieved it back. That was over two months ago.I phone them every couple of days and get only lip service, they keep saying it is coming.So before you purchase a BenQ product think about the possibility of it getting repaired...or should I say never seeing it again. Have been able to use mine for about 40 hours. After that it failed to respond to any input from any source. Contacted Benq and they said there was nothing they could do but send it in for repair since they have been having problems with these units. Sent it in and got it back. It worked once during a test preparation for a presentation but once again failed to acknowledge any input when turned on the next day during the actual presentation. Contacted Benq and they said I could have it repaired (wasn't repaired last time) or receive a refurbished unit (someone else's problem). So am working on my third round,maybe I'll be LUCKY this time. It will be my last Benq product. I can not recommend the product or company. 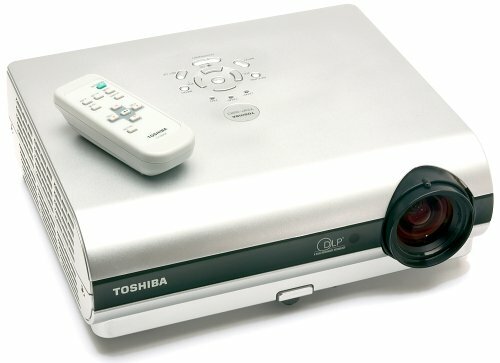 Rebate and recent flickering problems aside, this model is good for my DVD viewing.The projector works best with an additional component to RGB cable and a progressive scan DVD player.S-Video is too blurry for the 70-inch wide spread I'm using.After a year of use (~400 hours), it exhibited intermittent flickering in Cinema Mode and then began spreading to my other modes.BenQ quickly sent a refurbished replacement. I bought the projector at the end of March 2004 and promptly sent the rebate form to them within the week.In the week of August 16-20, 2004, I received a postcard that stated "Unfortunately, we could not honor your request because of the following reason: Unfortunately, the serial number you submitted is invalid or invalid due to special pricing. "I contacted the online retailer where I bought the projector, and they promptly got me in touch with someone at BenQ.That person responded, and throughout the next two months, we exchanged a few e-mails.The BenQ official said that the lamps were backordered and there had been problems with their rebate handler.I received my free projector lamp the second week of November (8 months after my rebate had been sent). After a year of use (~400 hours), the projector had an intermittent flickering that worsened the longer it was left on.The flickering was noticeable at the top of the image as well as the top and bottom left areas.In layperson's terms, the flickering appeared as if someone was rapidly turning the brightness up and down in those spots on the screen.I troubleshooted the problem with the default blue screen display and discovered that switching from Cinema mode to Economy mode would make the problem disappear.When switching back to Cinema mode, the flickering would return after a few minutes.The problem then spread to Economy mode a few days later.I had the projector plugged into an APC surge and power filter throughout this process. Now, the power button on the remote control sometimes acts as if it has been pressed twice and turns the projector off without waiting for the second press confirmation. Contrary to the review published here, according to one BenQ official I e-mailed, *all* replacements are refurbished and the warranty for the refurbished replacement is only as long as the warranty for the original projector.The "hot swap" process involved BenQ mailing a Word document to me (accidentally including all their tracked changes to the document), my printing and filling out the form as well as including my credit card information, and faxing it back to them.The credit card information is required because BenQ charges $1795 (the MSRP) to your card until you return your original one.This process also required me to print out a mailing label from a Web site for the return box.Return postage was handled by BenQ.When I received the replacement projector, I noticed some differences from my original one.Although the box and packaging was sealed the same as my original projector packaging, the projector menu indicated that the bulb had been used for over 19 hours.The remote control also had some food and/or debris on it while the back of its casing had been pried open with a tool that left marks (even the protective plastic had been peeled off its face).The replacement projector also makes a noticeably louder high-pitched squeal when on than my original one, and I had to clean off several smudges and fingerprints from the front lens.So far, it is working good, but it's used and the warranty is less than my original.BenQ should have made this information available upfront for buyers and prospective buyers. BenQ's customer service was average to good.They lacked following up with e-mails that I sent requiring me to forward my previous messages and indicate how long it has been since the original (I waited one to four weeks between messages. )There is also a bit of a disconnect between support and their promotional materials.The Qxchange service (i.e., the hot swap process) was not defined on BenQ's Web site--I had to look at other sites (and this review) to determine what it meant.I then e-mailed the BenQ officials I had been in contact with and they cleared up the matter.When I called their returns department, the person I spoke to did not even know what the word "Qxchange" meant.BenQ's Web site uses an outdated and non-user friendly Web form to contact the company's departments.No carbon-copy is sent to a person filling out the form, so users have no record of when they submit a request. The best relation price quality!!!! Forget about big screen T.V....this is better ! In a world of hype and deception, it is great to get a product that does what the ads say it will do. This projector is fantastic. I didn't have a screen when I first got my H30, so I used a wall for my screen, not even a white wall.....a pale blue one! Everyone commented how clear the picture was. My next-door neighbor has a big screen TV, and he said had he known about the quality of this projector he would have bought it instead. He has a 50 inchscreen, mine is over 8 feet, and can be much larger. The color is great, so is the definition. I finaly bought 6 old film projector screens from my local thrift shop. I "pieced" them together to makeone big screen. I made a silver colored framefor it. It looks great, and the picture is even better than before. My grandchildren say I have the biggest TV in the world.If you are thinking of buying a big screen TV, you should really consider this Home Theater Projector. You will be glad you did. Great Dedicated Home Theater Projector!! I received the Optoma H30 from Amazon a couple of days ago and I have to say this thing rocks! I thought the 800 x 600 res. would be a problem, but the image is beautiful! Even Hi-Def kicks (insert word here)! I have to admit that out of the box the picture isn't that great, but with some tweaking one can get the image to spectacular. The projector its self is well-built and seems sturdy and durable. The 6 seg color wheel makes for very accurate and vivid colors, including incredible blacks. Since the color wheel is 4x rainbows are hard to come by. The remote is great because it's average size which means even I can't lose it. The menu on this projector is great, it seems like you can tweak almost everything. I would reccomend this projector to a person who's on a budget, but non the less wants a great quality product. Excellent projector for the price! The H30 is an SVGA, 800x600 resolution projector, which is native 4:3 aspect ratio. However you have the option to run the H30 as a native 16:9 projector in 800x450 as well, and set it up to fill a 16:9 screen. Set up this way, a 4:3 image can be centered in the middle of the 16:9 screen frame with black bars on either side. On the other hand, if you are using a 4:3 screen, you can opt to view 4:3 material in full 800x600 resolution. Accordingly, 16:9 material will be viewed with black bars at top and bottom. It should be noted that the first H30s to be shipped did not have all of this functionality. However, it is all available with the latest firmware upgrade. If you own an H30 with the early firmware release, you can get it upgraded at no charge (other than one-way shipping) by calling Optoma Customer Service at 1-888-289-6786. 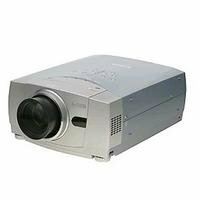 Therefore you have more viewing format flexibility with this projector than you do with the so-called "cross-over" projectors in this price class that are used for both business and home entertainment. Optoma has for the most part designed this particular projector to address the needs of the home theater market exclusively. SVGA resolution means you will have more visible pixelation than you would on a comparable XGA model. Pixelation on digital projectors, which is mostly visible in white text and subtitles, disappears as you move away from the screen. On the H30 it disappears at a viewing distance of about 1.9 times the screen width. 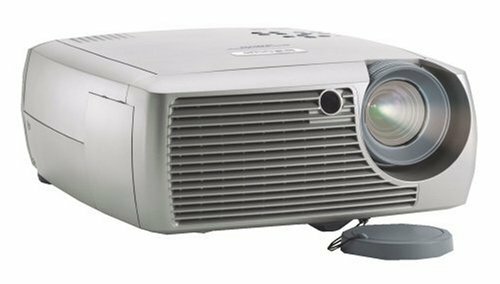 If you are bothered by visible pixel structure in text, subtitles, and credits, and you plan to sit closer than 1.9 times the screen width, you may want to consider an XGA projector instead. Brightness uniformity is not a strong suit of the H30. We found brightness to fall off by as much as 40% from center to the corners. Viewing a 100 IRE white screen, the unevenness of the illumination is apparent without a meter. However once video subject matter is in play, the unevenness of illumination is not noticeable unless you intentionally look for it. In typical viewing one is not aware of the issue. For DVD play, progressive scan input is preferred to interlace. Not only is a progressive scan image sharper, but it is also about 17% brighter which is an important factor on this unit. Overall, after calibration adjustments the picture quality on the H30 is stunning, and certainly one of the best (if not THE best) you can find in this price range. Blacks are solid black, shadow detail is very good, color saturation is excellent. Furthermore, the 4x color wheel will substantially reduce or eliminate DLP rainbow artifacts for those sensitive to them (more on this below). Note: The InFocus X1 is no longer being manufactured. You may want to consider purchasing the newer InFocus X2 multimedia projector instead. Weighing in at less than seven pounds and featuring simple color-coded connections, the InFocus X1 Projector was designed for easy portability. Compatible with both PC and Macintosh systems, the newly designed interface insures that your presentations flow smoothly, while the powerful 1,000 ANSI lumens of brightness will have your images lighting up small to mid-size conference centers. The X1 can be permanently mounted on a ceiling, and features a Kensington-style lock for security. A powerful 2.5-watt speaker is built in, along with an audio jack for additional stereo possibilities. The manufacturer includes a two-year limited warranty; register your InFocus X1 online at www.infocus.com and receive a free three-year extended service plan for your projector. Most standard VCRs, DVD players (progressive and interlaced), HDTVsources (1080i, 1035i, and 720P HDTV formats), TV and satellite tuners,camcorders, video games, and laser disc players. IBM-compatible computers, including laptops, up to 1024x768 resolution. I'm planning to get this projector but I found out Infocus repackaged this x1 for the consumer market called the "Screenplay 4805", it's basically the x1 with newly added upgrade extra features.The best place you can get is not online but at Costco for only $1300 with a FREE 72" screen included....what a steal...where can u get a projector with a free screen....wow! After having replaced a fine 55" Mitsubishi HDTV with this projector, everyone who has viewed movies in my home theater can't believe the X1 sells for under $1000.Sure, it has no NTSC tuner nor any sound system worth mentioning, but that's precisely the point.All that stuff is outboard for even the most modest home theater enthusiast, and thus is redundant and unnecessary (as well all more costly) when purchasing any other type of monitor.The 7200 and 7205 are truly fine machines, but they are not worth the thousands of $$$s more than the X1, unless you are a fanatic.I still don't believe this unit performs as well as it does.DVDs explode into life and even Directv looks pretty sensational.Finally, remember the X1a and X2 do not include Farjouda processing.Big difference from my perspective.With the X1 you can't go wrong. Home Theater Is Looking Good! The X1 projector is a great addition to my home theater.I ordered the composite adapter and DVD watching is superb.I also watch VHS tapes via the S-Video input and depending on the quality of the VHS tape, the results are unbelievable.I sold my 56" HDTV Monitor and bought the X1 and was skeptical about the claims made here at Amazon as well on the Home Shopping Network.Now that I have been using the X1 projector for the last 60 days and have gotten used to it, I don't ever plan on spending $2300 for a TV that is measured in inches and that weighs 300 pounds.I have my X1 setup in a light controlled environment in my semi finished basement and the presentation is approximately 10'x 11" diagnal, you can't get closer to the movie theater experience than that.I am using a Panasonic DVD player and a JVC amplifier for DTS, Dolby Surround, Surround 5.1 sound and 10 speakers for the audio.Like the one person's comments, I'm not a tech nut either but I know great video when I see it.There is a reason that merchandise stores display 100 TV sets on the main floor as soon as you enter the doors and hide the projectors in the back corner.Because once you have experienced the projector you will never want to spend more than twice the money on a TV that is limited in size as well as warranty care.My X1 was too easy to hook up to my DVD player, VCR (for TV channels), RCA video for the kids' Play Station 2 and amplifier.I am no longer a skeptic and when friends see the quality and size of the video of this light weight powerful unit they can't believe it.Some TV channels such as ESPN, MSNBC, TLC etc, I can watch in moderate light without any problem.I downloaded the latest software update from the http://www.infocus.com website simply by connecting my X1 to my computer and was done in no time at all.You need one of these if you enjoy home theater and for the price you can't go wrong. The X1 really shines projecting DVD's. I bought the X1 as a business projector as well as home viewing of DVD's. On the DVD front, this unit really really shines. I used my laptop and connected via the included vesa cable, selected the Film preset, and projected about a 70 inch diagonal image on a glass-beaded projection screen. The images were well saturated and gorgeous, as good as any movie screen. I took the sound from my laptop headphones out jack and attached them to some Sony powered speakers and got great sound. You will not be dissappointed with the DVD video quality of this unit, not for a moment. People talk about seeing weird effects with the DLP processor. If you really try to analyze the heck out of the image, you might notice a little bit of slowness in the ability of the processor to keep up with fast moving images (like a person jogging across the screen). But basically, if you relax and go with the flow, you won't notice anything about the DLP image except how fantastic it looks. Try watching "Under the Tuscan Sun" with this baby and you'll know what I mean. My girlfirend and I can't imagine what it used to be like watching movies on a normal (ie. 32 inch) tv screen. Once you've gone 70 inch diagonal (and greater, if you have room for a larger screen), you can't imagine watching video on those 40 or 50 inch little pooper screens. As for business presentations, definitely pick another preset like Presentation. The presentation quality is good but not amazing. Probably better off with a non-DLP unit if presentations are your main bag. Anyways, don't think a second about it. Get the X1 and never watch a DVD on a puny screen again. 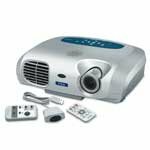 This projector is great for a set-up in a smaller room in which you are able to control the ambient light completely. I bought this and use it in a studio apt. with bay windows, connected to my computer (which has a DVD player).The things I don't like are that my room is a little over 20 FT., and that makes the picture too big (you can't control the size of the image that much, its based on distance to the wall), unless I pull the unit further into the center of the room. I originally wanted to mount it on to the ceiling,but the distance is too great. So I would recommend using it in a smaller room, about 15 ft or less. The image quality is great for DVDs, just adequate for computer work (I'm farsighted and wanted a large screen to work on- its just not high enough res. for that. )Also, the image from a TV is not good and shows jaggy lines with the standard video in jack.I haven't found any resolution for that. So, know what you are getting.A great home DVD theatre, but just not enough light output for daytime use, and not very good with standard TV signals, and not great for doing anything beyond simple powerpoint presentations.I would not hesitate to get a unit twice as expensive if the lumens were twice as much, there was more play in the ability to control the image size, and greater resolution than 800x600. Okay, digital projection on a budget? I bought this item a few years back. The first $400.00+ bulb blew out in less than 300 hours. I contacted Toshiba and they replaced it, since it didn't get anywhere near the 2,000 hour "lifespan" they claim. The next bulb blew out at 460 hours. I called again. Nothing. No replacement. No service. I was on the phone with them for 4.5 hours and all I could get was 2 promises to "get a call back from one of our supervisors". None of my messages were ever returned. No one ever "called back". No replacement, or offer to replace, or even service sans the attitude. If the bulbs lasted 1400 hours, or even 1,000, I wouldn't be nearly as upset about this hunk'o'junk, but at $400.00+ per bulb, I'm paying an extra $60 dollars for every hour I watch it! Also, I've been typing $400.00+, because the bulb cost has risen every time I've checked into it. The current SRP is $453.00 for one bulb. If you get over 400 hours on a bulb, you're lucky! Avoid this unit, and after my experiences with their "customer service"-less calls, avoid this company's products like the plauge. My husband has wanted to get a video projector for a while, but just never took the plunge. (...).I convinced him to get this for himself for a late Christmas present. We brought it home and hooked it up easily.My family is watching "LOTR - The Two Towers" right now.We can not believe how cool this is.